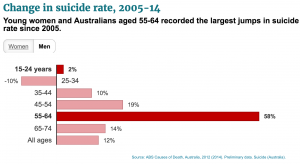 The suicide rate for both men and women approaching retirement age (55-64 yrs) has risen by over 50% in the last 10 years. Why this group? Baby boomers – of all groups. The great promise of reward for effort is deserting some of us. The need to adapt is an evolutionary imperative, but some are reaching this stage of life, and believe adaptation is beyond them. Where suicide may be driven by feelings of being worthless, helpless and hopeless, “job security” has promised relief and created dependency. Now it has been exposed as not only the big lie, but the perfect anaesthetic – an opium of the masses – masking vulnerability. This is not new – the company doesn’t love you back. We live in a unique period in history where our average lifespan has increased to 80+, but people are still thinking the old way, like they will die shortly after retirement. The old way of thinking, as if a lifespan to 70, suggests you only need enough superannuation for a few years; that you can be overweight and it won’t bother you for long; and that there won’t be enough time to get bored. The new mental challenge of a longer lifespan is planning. Damn it – I thought old age was all about not having to plan anything anymore. Will your superannuation keep you for 30 years – is it big enough? Will your health sustain you for 30 years – are you mobile, with a good diet? What will you do with boredom – can you sit on the sofa for 30 years? We may have thought of life and career as 20/40/60. Leave home at 20, get married and build career till 40. Kick out the kids, then pay off the debts. Approaching 60 and in early retirement, you’d take your trip to Europe, before a heart attack took you. These days, its looking like 30/60/90 is more representative. Choose a life partner and family from 30 after global travel or career establishment. Family and career through to 60, and then what? 30 years of nothing? These types of issues are serious enough for there to be an increase in the rate of suicide for this particular demographic. And this only hints at the silent, confused unhappiness being endured by many when they ‘arrive’ and wonder why the party hasn’t started. 60 is the new 40, and all the more confusing because of it. Even though research shows that a typical working life will involve 5 careers and 17 employers, there remains right now a generation still living in single employer and single career mindsets, with one-dimensional plans for how retirement will work. They are surrounded by change, don’t think about it much, hoping to get through without being affected. But the speed of change has beaten many of them. New thinking is required – its not too late – but it is urgent. The hardest part is reaching them before the hammer blow hits. Unhappy and undiagnosed mental ill-health, surviving and battling on, leaves us vulnerable when a redundancy happens, or a divorce, or an illness. Re-assess your superannuation and lifestyle needs. Get a health check – get your weight, drinking and smoking under control. Reconnect with your family, and long lost best friends. Find something new to do, that interests and challenges you. You’ve got more time than you think, and an unprecedented range of possibilities.